I just drooled a giant puddle on my desk, thanks a lot. I am going to have to hear A LOT MORE about that sofa setup you guys have. Great job, kids! Wow, it looks so cozy. Wanna snuggle? So beautiful! Love the painted ceiling color. And just in time for the scorching heat!! Great job!! Wow! What a transformation!!! You did a beautiful job! Holy smokes, that looks AWESOME! Robin! Just to be clear? The 'before' picture is BEFORE WE MOVED IN! THAT IS NOT MY CRAP. MY crap is WAY classier looking. i must, must know what the ceiling and floor colors are! i must or i will not sleep! Helloooo Oasis! Great job and a fun place to hang out. I would eat out there daily too! FAN-FREAKING-TASTIC - another diy job WELL DONE! Wow, wow, wow! It looks fantastic... I love the colors! 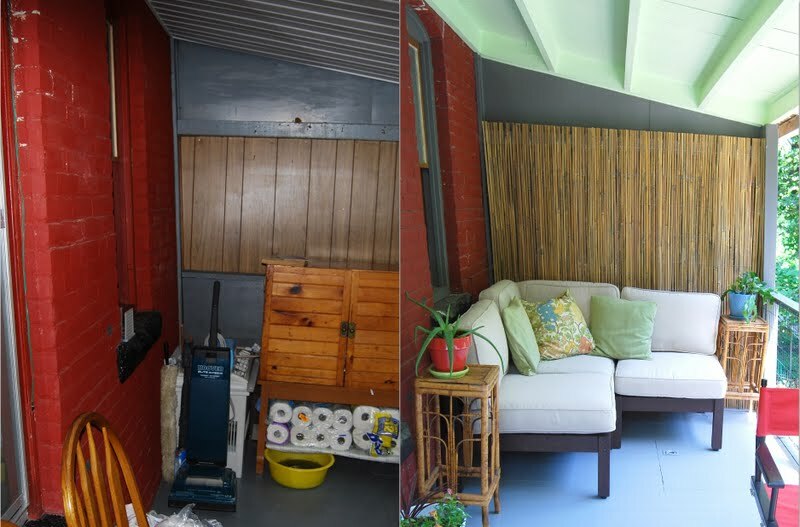 From the colors to the bamboo wall, absolutely fabulous! uh-freakin-mazing! What a beautiful transformation. Kudos to you on a job well done. Love the 2 tones and that green is divine. Dining room will miss you. I can't get the full words out. That's how pret is it. "insert favorite swear word"!!!!! That is amazing! Looks fantastic! I LOVE that ceiling color. GOREGEOUS! I love all of the colors you used--I love everything. 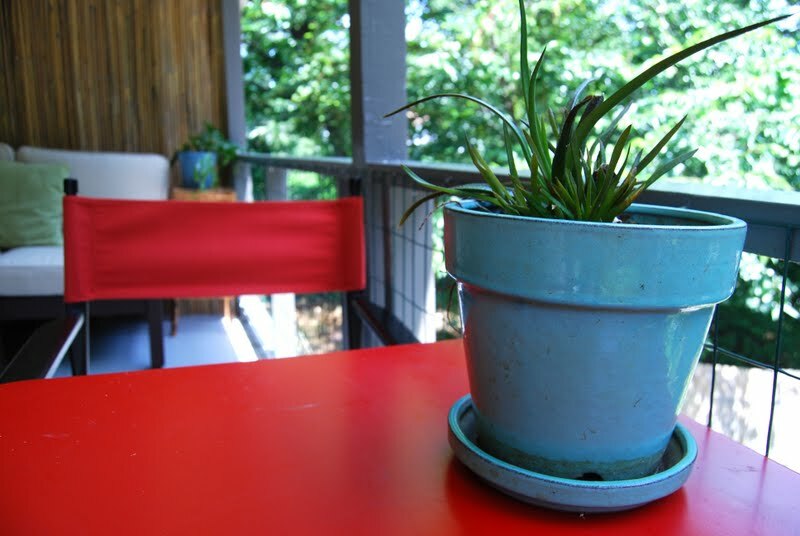 The pop of red against the blue, the bamboo, the green ceiling. Completely AWESOME!! I adore the look of the upholstered outdoor furniture but am wondering how that all works in inclement weather. In your case obviously you are sheltered quite a bit, but what do you do when the cushions get wet? I wonder what people who keep theirs outside do - do you keep the cushions put away until it's time to entertain? I can't imagine that stuff dries out quickly. Soggy cushions are not fun! 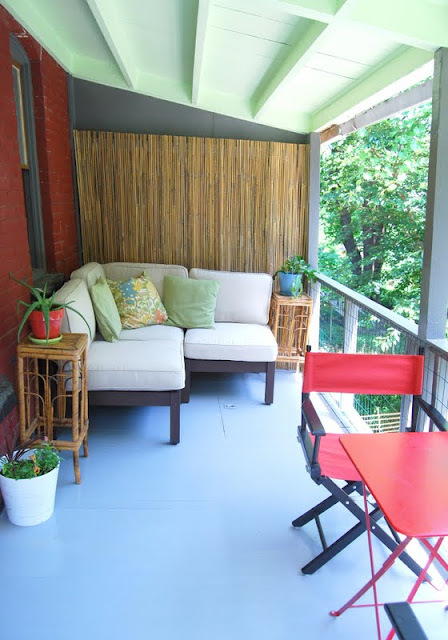 If a big ol' storm is coming, we move the bamboo plant stand closest to the railing, and we fold up the director chairs and move the cushion set closest to the railing, but that's about it. 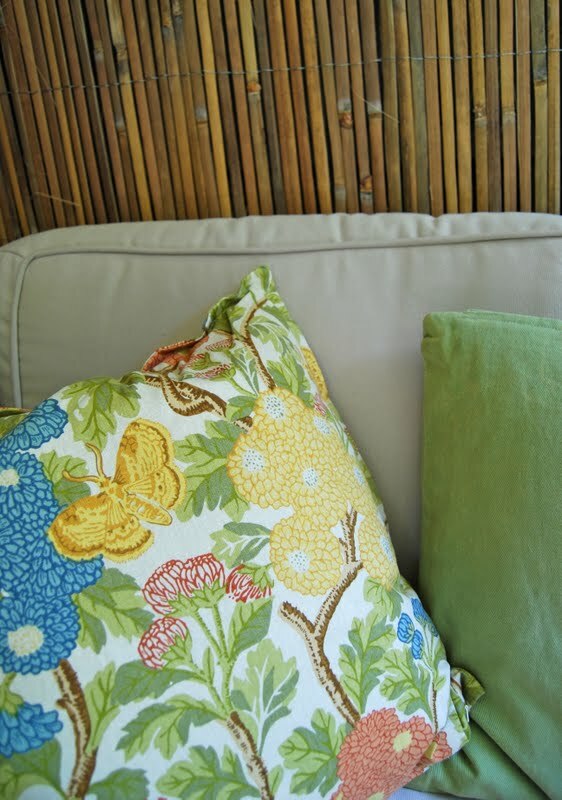 The fabric on the corner piece is sunbrella, so very quick drying, and the cushions are outdoor cushions. So far we've had two frog-strangling storms and all's well, but a few weeks of experience could be VERY different than one year of experience. I'll keep you updated! From yikeys to fab.u.lous. Awesome job!! This is such a great transformation! Very cool and pretty!